Geez, it feels good to win something once in a while. Dave and I went out to the casino today for our little "date". We don't do it often but it's something we like to do, just the two of us. We both like to play the slots and the penny machines with the fun bonuses are our favorites. Today, I actually won some money and walked away with cash in my pocket. Yipee! The quality of these pictures are crummy because I took them with my cell phone. Of course it was on the down-low (shhhhh) because you aren't supposed to use cell phones while you are sitting at the machines. $547, cool huh?? I finished one more layout this weekend for the "Use your stash" challenge at Dreamer. I used up some old chipboard alphas that have been in my stash a while and since I've fallen in love with Thickers, I've been neglecting some of my other really cool alphas. 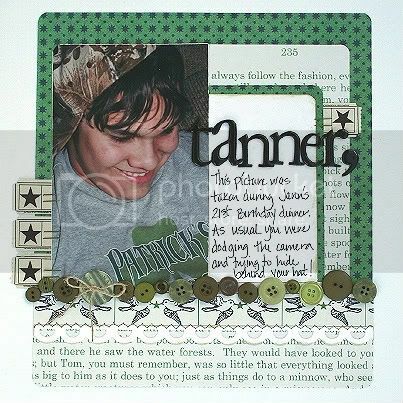 These ones were a little boring but I added some glassy accents and voila...a fun layout of Tanner. Gotta love all of Jenni Bowlin's new lines. After working with an assortment of her papers for the May Citrus Tree Studio "County Fair" kit...I just couldn't get enough of all of Jenni's goodies. I bought the full Varsity line and printed tickets directly from the Jenni Bowlin website but I suggest you wait for the CTS kit reveal in two short days. Cindy has perfectly coordinated papers from all three new lines (Varsity, Trendy, and Farmers Wife) with just the right cardstock and embellishments for a fabulous kit. Congratulations on your win Tammy, $547 is great. I love that layout of Tanner. I haven't used much of Jenni Bowlin's products.